Whose Tax Plans Will Create More Jobs? Job growth over the 10-year forecast horizon is more than twice as high under McCain’s plan than under Obama’s. 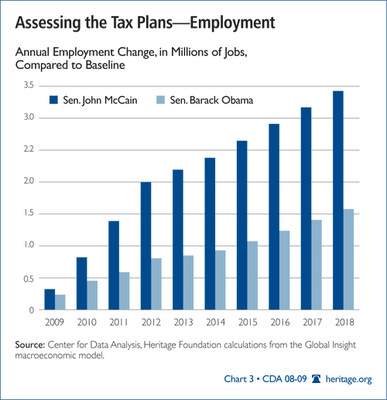 Senator McCain’s plan yields consistently higher forecasts of economic output than does Senator Obama’s. Increases in gross domestic product (GDP) under McCain are, on average, nearly three times higher than under Obama. Jobs will be the most important thing for our economy the next five to ten years. If predictions of a severe recession or depression are true (and I believe they are), then the most important thing is keeping as many people as possible employed. People with jobs pay bills, buy goods and pay rent or a mortgage. People with jobs also pay taxes to fund all that government spending. When millions are out of work and unemployment is over ten percent (or 25 percent during the last depression), that’s a lot of people with little purchasing power, let alone any sense of any financial security. Who Said John McCain Isn’t Funny?